With Allison otherwise engaged this weekend I had some time to myself. 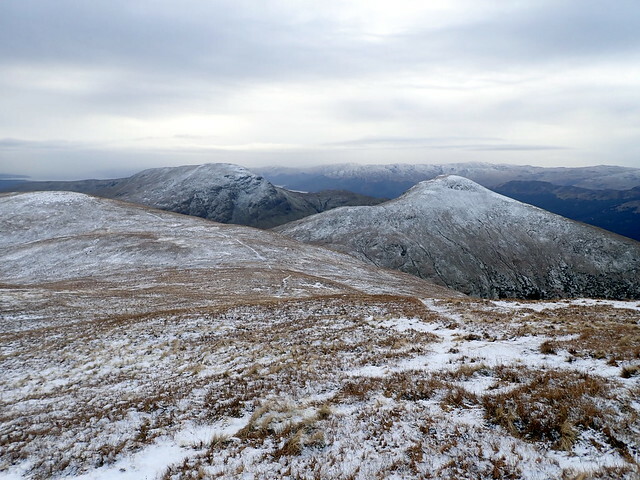 Munros, thought I, get a few more under the belt on a break from Corbetts. 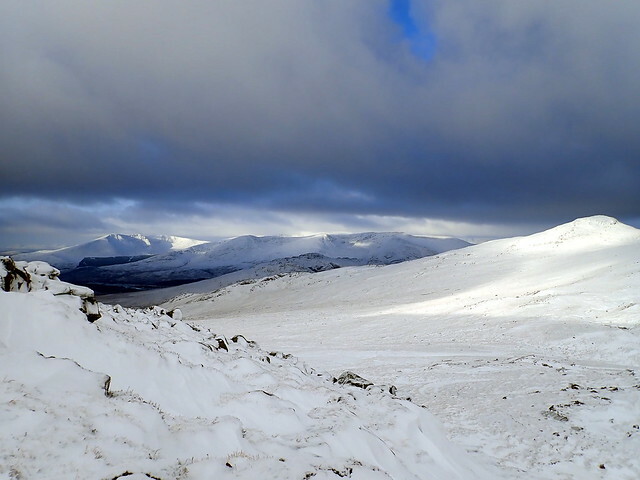 A three day trip to the Cairngorms was dusted off, having been put on hold a couple of weeks ago due to weather reasons. 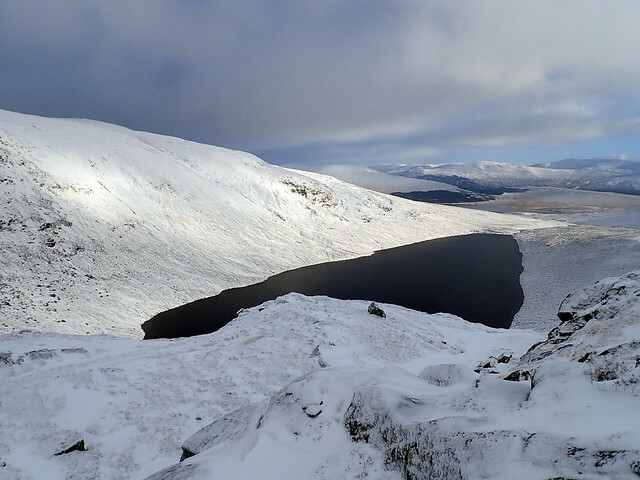 And what do you know - same thing happens again - Braeriach forecasted to have an upper temp of -7, a minimum of -14 and a "feels like" of -21 along with cloud cover and 40-50mph winds - probably not the best conditions to set off myself for some high level camps. 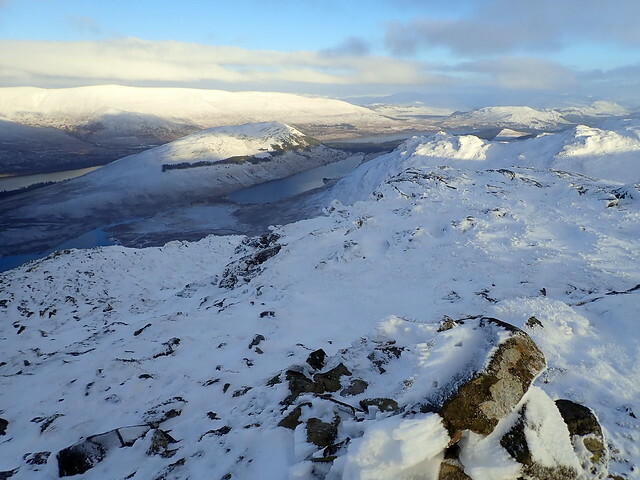 So a plan B was put into action - I'd head up on Wednesday afternoon after I'd finished my first Philosophy class and head for the hills around Loch Laggan. There was a spot on Lochan na h-Earba that I'd previously scoped as a suitable campspot, I was keen to try it out. 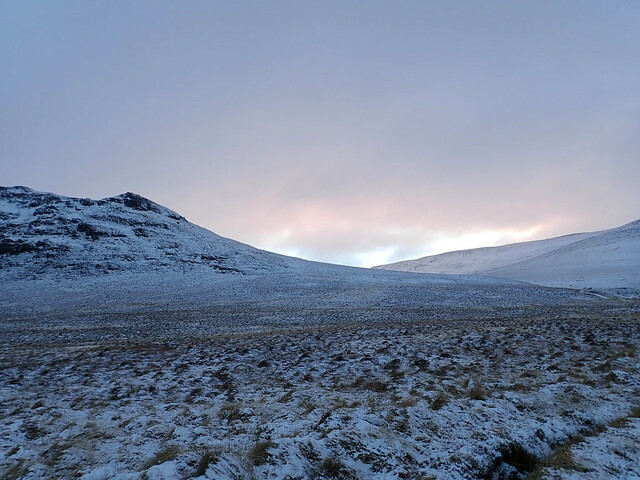 Weather was quite pleasant on leaving Glasgow, however by the time I reached Drumochter it was sleeting and the mix of rain and snow didn't stop when I parked up the car. I've written before about enjoying a walk-in in the evening, but it's less of a pleasure when the rain/snow is falling. It also makes walking by headtorch a little interesting as the streaks of snow shine like white bars across your vision. And I took a wrong turn and walked into the quarry dump - I realised I was not going the right way when my path was blocked by an enormous mound of gravel. You live and learn. 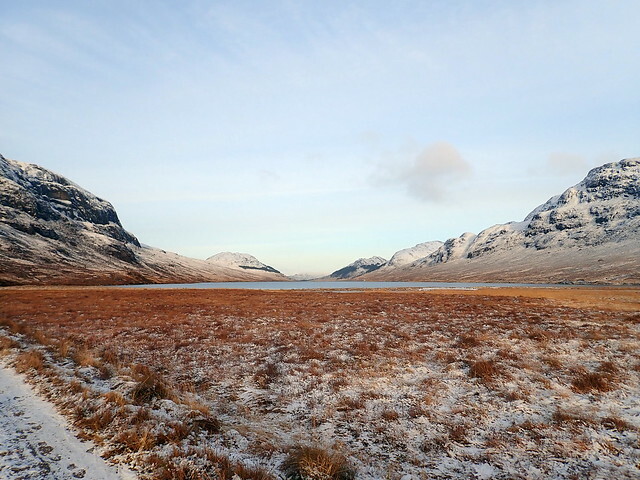 When I go to the shore of Lochan na h-Earba there was no sign of the sweet space I'd previously seen. The wind was also blowing fiercely right towards me along the lochan. All I could find was a slightly sheltered spot below a bank, but that meant pitching on sand. Not the most robust anchoring for a windy night. I have sand pegs, but they were in the car, of course. 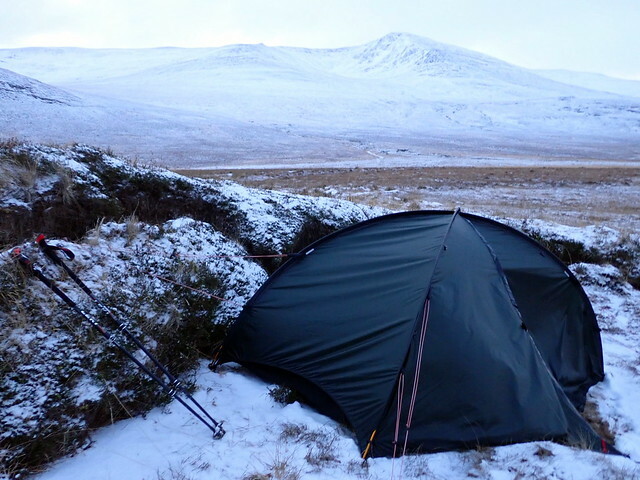 I did the best I could to pitch effectively but didn't much like the way the wind was blasting against the tent, nor the way the snow was accumulating on the exposed side. Creeping into my sleeping bag I told myself that the wind wasn't going to be strong enough to lift me and the tent - Dorothy in the Wizard of Oz style. And so I managed to sleep fairly well under the conditions. The wind had dropped by the morning and my first look outside revealed that snow had been falling. 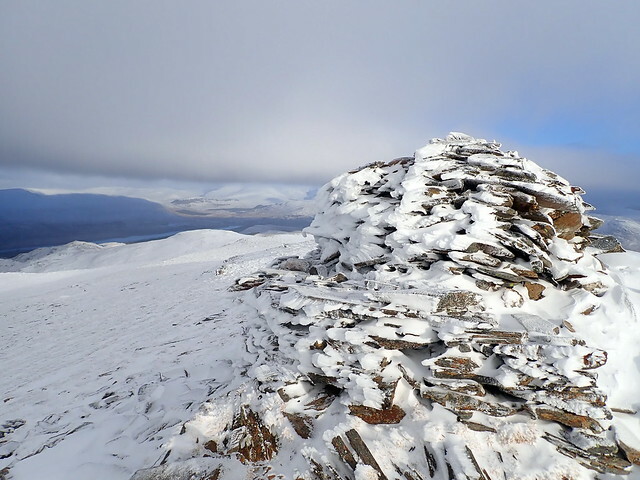 I had - rather ambitiously - thought that I might take in four or five Simms along to the east of Lochan na h-Earba that would lead me up behind Geal Charn - but that would add around 10k to the day. With the amount of snow lying that did seem a big ask. So, with a small curse, I decided I'd just do the three Munros and take on the Simms another time. Yeah right... After breakfast and packing away the tent - which had dried out in the wind overnight - I set off for Creag Pitridh. 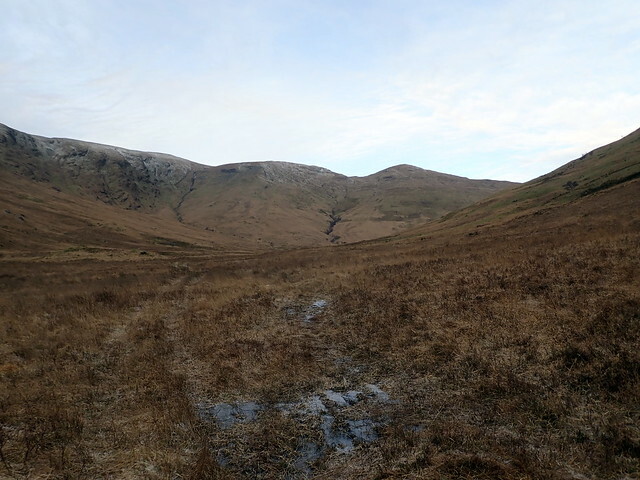 My recollections of the ascent to this hill are of wading about in snow and deep tussocks - here I was having the experience all over again. 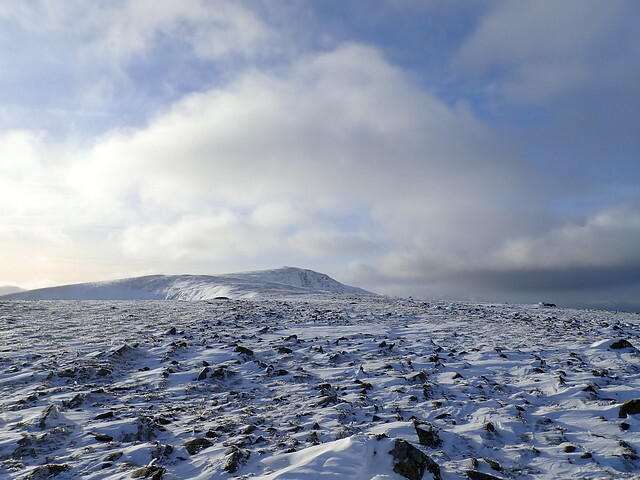 Although the path was only dusted with snow, when I turned uphill I was quickly up to my knees in powdery white stuff. At least I had good visibility today. 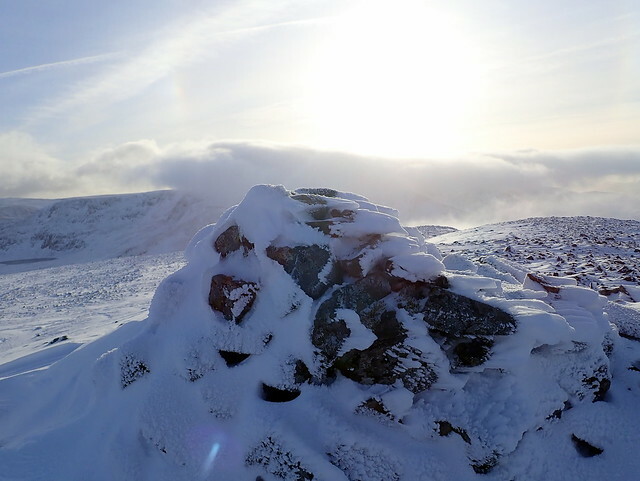 I made slow sweaty progress up to the ridge, the final ascent seeming to come quickly and the cairn was greeted. 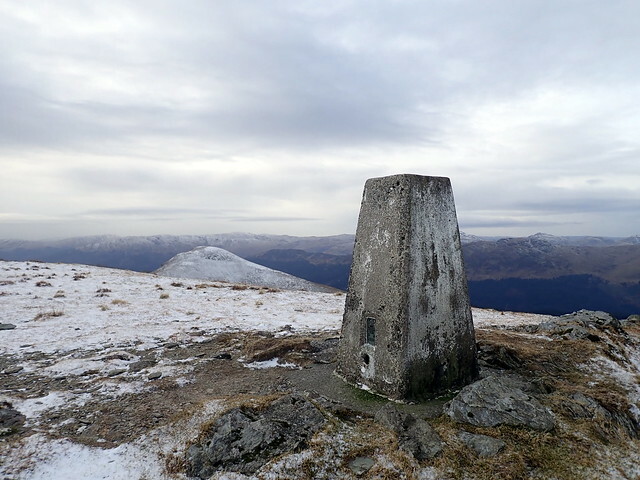 Munro number 200 on this round. 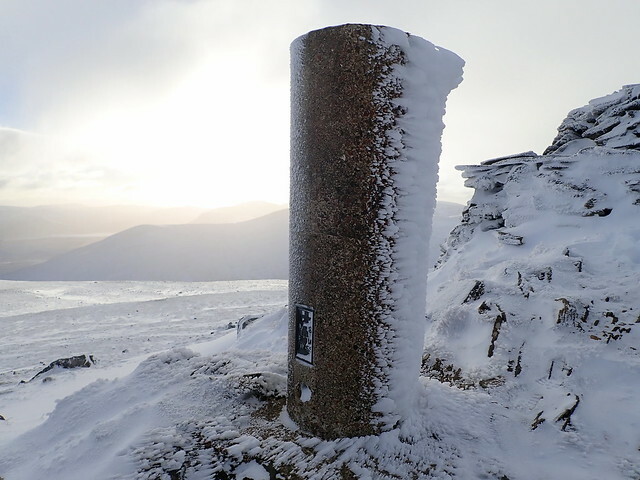 I elected to bypass the usual craggy descent to the south west and began the long pull up to Geal Charn. Not a soul about, nor any animals, although there were prints of hare and fox. The sun gleamed on the snow at the summit under a dark, rather woolly cloud, perhaps more snow on the way...I thought (briefly) about descending to the north east for two of the Simms but since that would involve a descent of around 250m to reach them (which would have to be re-ascended) the though died. 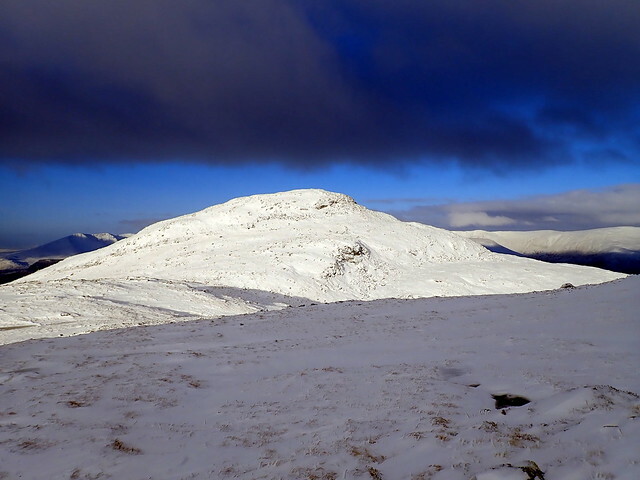 Instead I turned around and prepared to head over to Beinn a'Chlachair. Stopping for lunch on the western slopes of Geal Charn I considered my options. 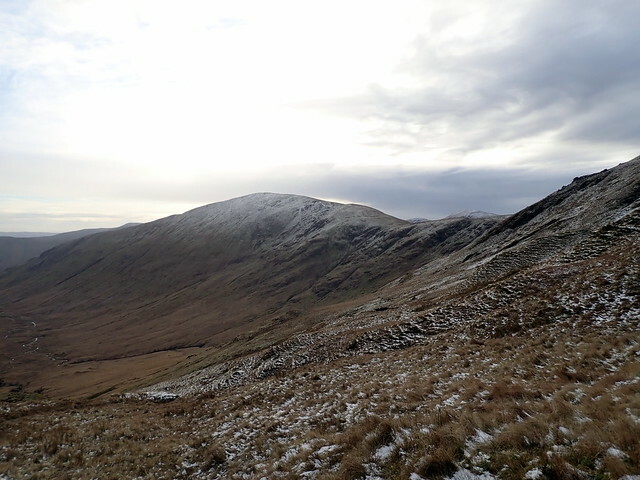 Last time going up the northern ridge had been a little severe, with steps having to be kicked in very steep snow. 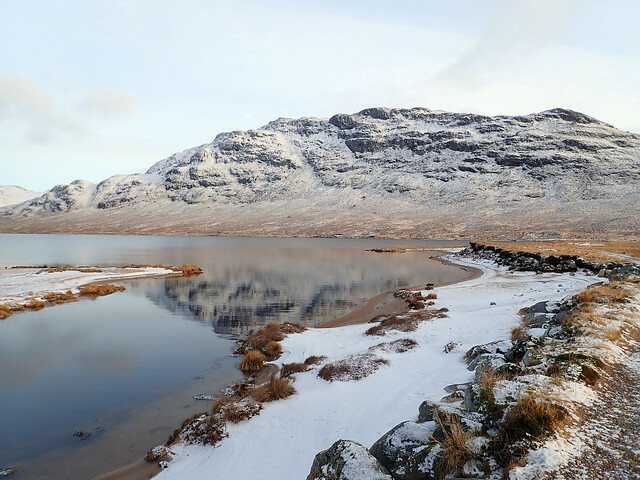 I thought I might follow the track round to the gentler southern slopes of the mountain, passing by Loch a'Bhealaich Leamhain and was all set to do this when I noticed fresh footprints. In fact I did a double take - these footprints had the same sole-pattern as my own boots (Salewa Ravens, not that commonly encountered). I had a quick check to see if I had gone out of my mind and was following my own steps, but no, they were another's and there was also a small canine companion by the look of things. Unless he was being tracked by a fox. The bootprints were heading up the northern ridge, so I decided I'd head that way too. After a short time I spotted the person responsible, along with his small terrier who didn't look overly impressed with the deeper patches of snow. Catching up we walked together for a bit to the summit. We took different routes down - he carried on along the northwest ridge whilst I descended by the WH route which I reckoned would be quicker to the car. 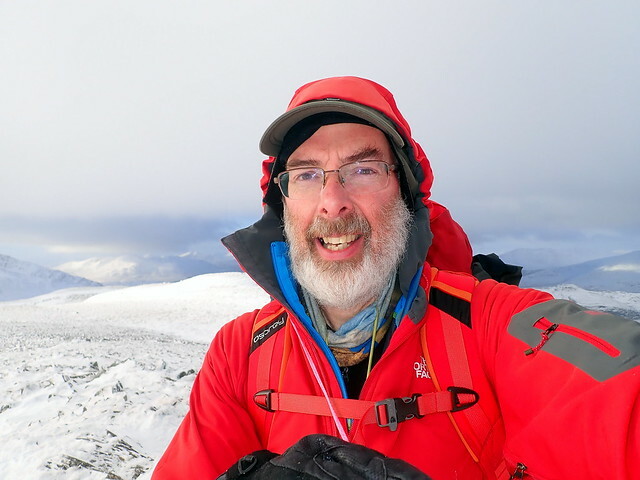 I was starting to feel the pains of being out in winter boots again - how lucky to have been able to get away without them in the last couple of months. Back on the path and glad I hadn't tried to include the Simms - I was feeling mighty tired after plowing through the snow today. 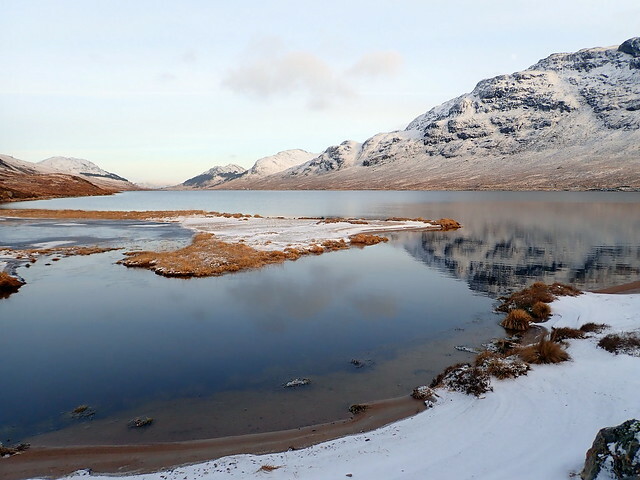 My plans had been to drive along the wee road towards Fersit, and use a camp spot we'd had before then do the Chno Dearg pair on Friday and the Easains on Saturday. However, as I walked along the bit of road from the locked gate to the bridge I was troubled by the glassy nature of the frozen snow and ice. My companion had mentioned he'd had a few skids coming down from Aviemore this morning and I became twitchy about the wee road to Fersit. So bang went my plans for this evening's accommodation and for tomorrow's hills. I considered just heading home, but it was starting to get dark and I felt quite tired. So I headed for Loch Linnhe caravan site - reliably open all year and paid my money for a pitch. And a wonderfully hot shower. 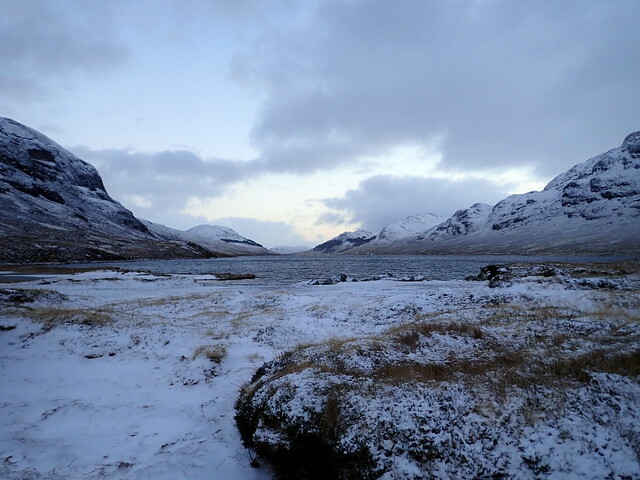 Phone reception allowed me to check the forecast - I thought maybe Bidean nam Bian on the way home? Managed a fair night's sleep despite the best efforts of the industrial estate machinery to keep me awake - as usual they seem to work all night with a short break around 3am. As there were no Munros left on my to-do list on the way home I thought about smaller things, namely Grahams. There's that little cluster by Luss - surely some of them would be up for grabs. 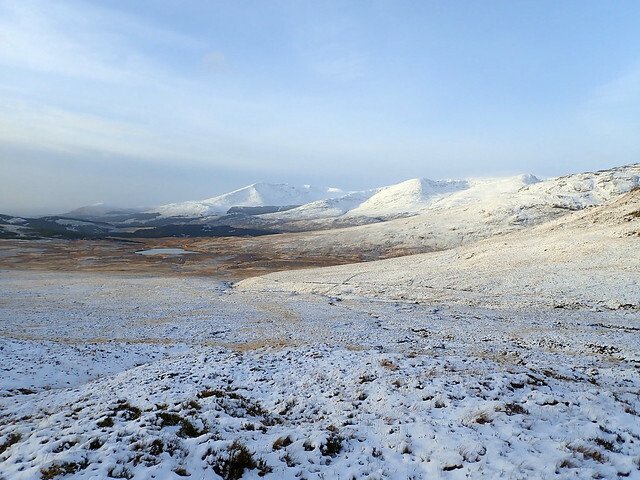 Initially I thought I might just do Mid Hill, but, deciding to drive up Glen Luss's narrow road I had my sights set on the trio of Doune Hill, Creagan t-Sidhein and Beinn Eich. Not much sign of snow down here, thankfully, although the road was very icy beyond the turning place. The soggy track that leads up Glen Mollochan was partially frozen, which was something. I was sheltered from the wind and found the effort had warmed me up. I paused for lunch at the top of the glen before starting the slog up Doune Hill. Watched by various sheep I wound my slow way uphill, counting steps to distract me from the pain of it all. 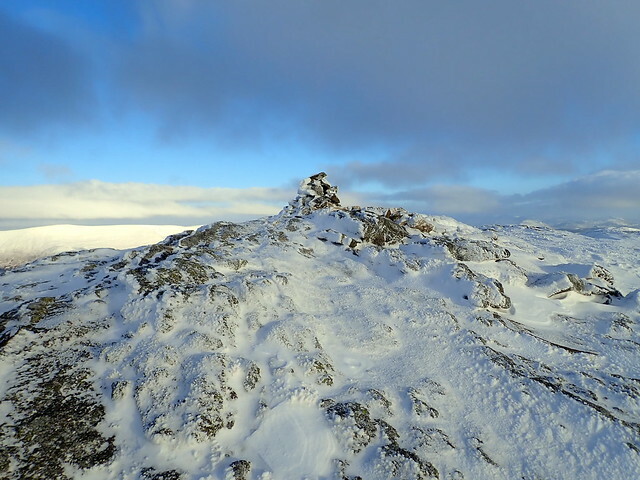 Nearing the summit, the chill wind caught me, ground all frozen. 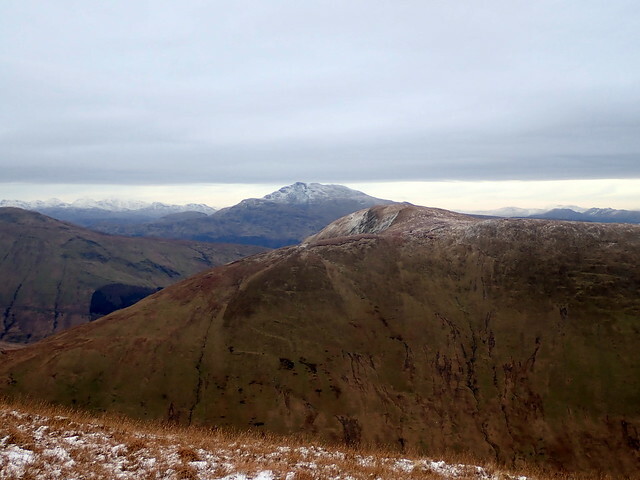 Good views over the Arrochar hills. After the trig point on Doune Hill I knew what was coming - big drop to Creagan t-Sidhein. 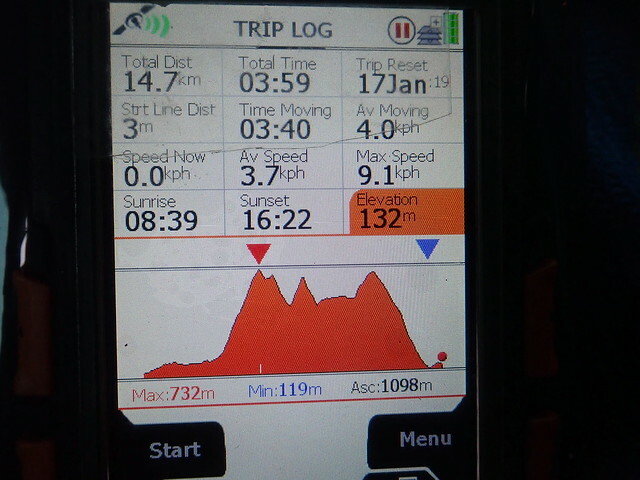 Actually it's not as bad as it looks - I was surprised to find it was only 170m ascent from the bealach to the summit. 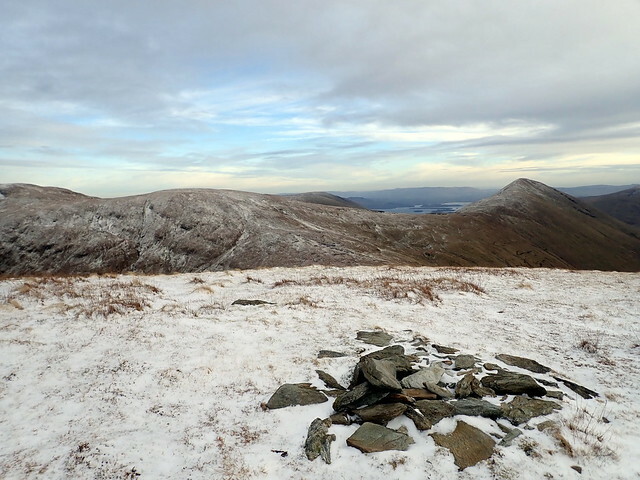 I contoured along the southern flank of beinn Lochain to reach Beinn Eich, which provided a path and a nice gentle slope up to its summit. 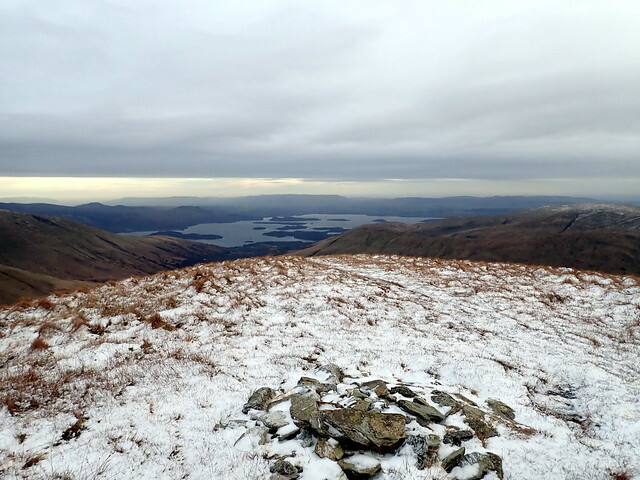 Good views over Loch Lomond and a curious flat layer of snow bearing cloud sitting right over the northern sky, just above the top of Ben Lomond. 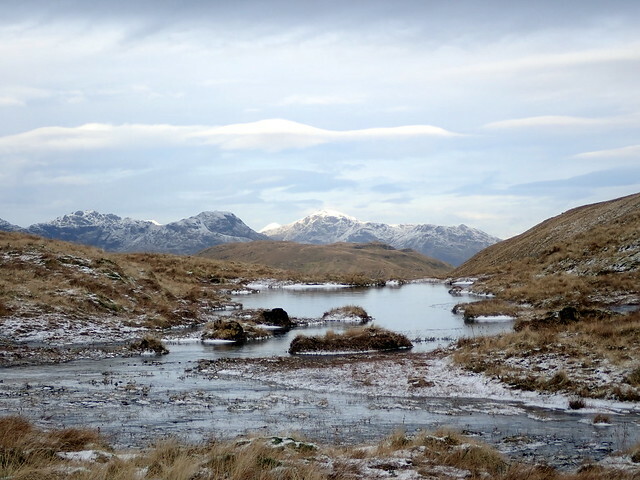 Descent was quick and the marshy patches I remembered from last time were mostly under ice. Back at the car in 4 hours - one and a half hours quicker than at the last attempt two years ago. 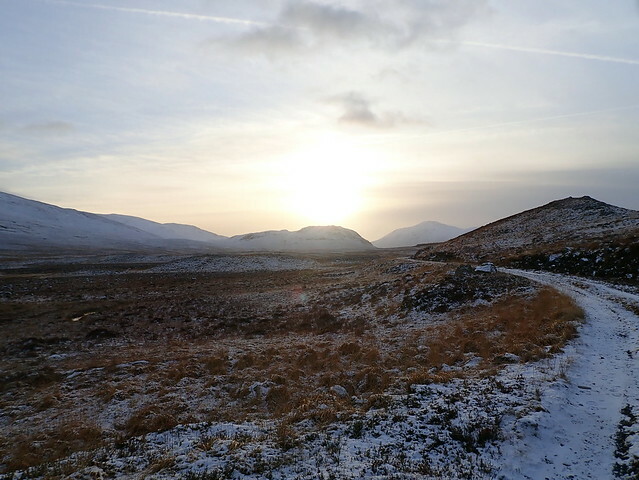 Glen Mollochan - no snow! Enjoyed your wild wintery wander, weaselmaster.